Nearly one in five US smartphone owners (18%) have now used a mobile payment app, research released by Parks Associates reveals, with PayPal proving to be the most popular among all US smartphone users with 12%, followed by retail-branded mobile apps (9%), Apple Pay (4%), Android Pay (3%) and Samsung Pay (2%). While more than 67% of mobile payment app users are only using one mobile payment app. Mobile payment app users report spending US$98 per month using PayPal, $75 per month with Apple Pay and $56 per month with Android Pay. 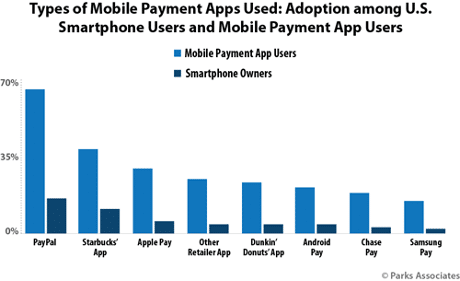 Among retailer-branded apps, Starbucks is the leader with 7% of US smartphone users, followed by Dunkin’ Donuts (3%). “While PayPal is the clear market share leader, more merchants are requesting information from Apple Pay than any other mobile payment solution,” says Chris Tweedt, research analyst at Parks Associates.